Select PV Series Plug Valves for your applications. 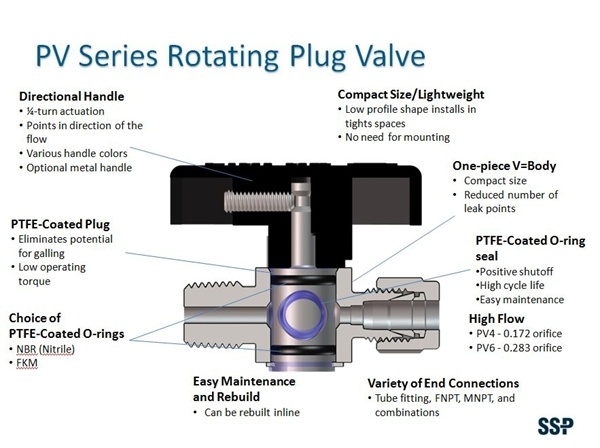 Download the PV Series Plug Valves Catalog. Quarter-turn plug valves are used in a wide range of industries. Low torque makes them a favorite for applications requiring frequent manual actuation. They can be used as isolation valves and vent valves in to control valves, in laboratories for air systems, gas selection manifolds, gauge isolation, and drain valves. They can often be a less costly alternative to pipe ended ball valves. Quarter-turn plug valves are designed to allow throttling to control flow and to create "soft" actuation in systems where designers desire both the softer application provided by needle valves with the quarter turn simplicity and higher flow of a ball valve. Plug valves are available with a downstream vent to safely isolate the pressure source vent the downstream pressure so that devices such as pneumatically operated spring return valve package can be maintained more safely.